The 'Young Black Man' Who Reluctantly Became An NRA-Certified Instructor RJ Young developed an interest in guns in order to bond with his white father-in-law. The experience is chronicled is his new book, Let It Bang. 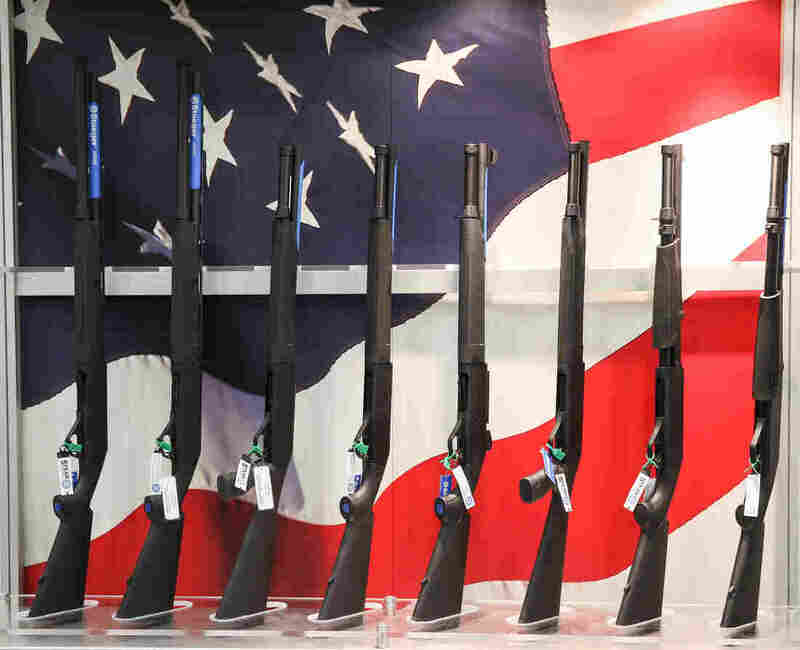 Firearms are exhibited at the annual NRA convention in Dallas this past May. RJ Young's book Let It Bang examines the NRA's relationship with race through his personal, unexpected interest in guns. RJ Young wasn't always into firearms. Quite the opposite. "Because I always knew that guns were something that could get me killed," he says in an interview. "They weren't really around to help me. They were always, you know, pointed at me or somebody who looked like me." Young is a writer and sports commentator, especially on Oklahoma Sooners football. He's a black man. But then he met Lizzie, the white woman from Oklahoma who he would go on to marry. And the way he thought he could win over her father Charles was by doing the thing that he loved: shooting guns. And the more he began to learn about guns, the more he felt that he had to become an expert — that he had to become an NRA-certified pistol instructor. "Well, if I get this certification, nobody can tell me s***," he says. 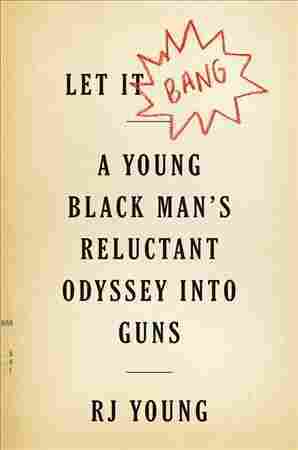 His new memoir is called Let It Bang: A Young Black Man's Reluctant Odyssey into Guns. I was dating a woman whose father was the only guy — or seemed to be the only guy — in Oklahoma who could give a damn about football, especially Oklahoma football. And I had no way to get in other than Lizzie. That was the thing we had in common. But if this was going to work, I needed to be able to talk with Charles about something that wasn't Lizzie. The first thing he did for me ended up being one of the coolest things that he's ever done for me. But at the time it felt very threatening because I am a black man in his house. So he shakes my hand, after Lizzie introduces me to her father and her mother, and he just bolts. You know, he leaves the room. He goes down the hallway, he comes back and he's got the biggest damn revolver I've ever seen in my life. It's like a flaming scimitar to me. And he hands it to me. Now I'm looking at Lizzie and looking at her mother Nancy and I'm going, "Does anybody else — does this resonate with anybody else?" And, you know, I give it back to him and I don't make a big deal out of it. I asked Lizzie later, I was like, "What was that?" "Oh, he's very proud of it, and he wants you to know that," and putting together that that was one of the first things that he had done as an act of friendship, as an act of "Hi, nice to meet you." I want to get to know the man. And if this is the way to get to know the man, let's get started. I grew up around baseball card shows. My dad sold baseball cards. I collect baseball cards. So I came to find out that going to a gun show was a lot like going to a trade show. But it was different for me because I had a very, very hard time finding someone who was not white at [what's billed as] the world's largest gun show — which is in Tulsa, Okla. It's put on by Wanenmacher's. It happens twice a year, November and April, and at the time we were going, well, there was this president running who was black. And the thinking among gun enthusiasts is: This is the dude [Obama] to take guns away from us. The numbers are like 40,000 over a weekend in Expo Square, which is in Tulsa, and I'm walking around with the man who would become my father-in-law the next year. And you know, I'm with him, so it's OK. And I thank him profusely for that, 'cause I wouldn't have gone myself. And we eventually find a gun that I like, and I'm willing to pay for it, but he is insistent. He wants to buy me my first gun. Young: Charles and his family live on a lot of acreage. And when you have a lot of land, you can make your own gun range. So we all piled into a truck, and we drove across the hills and the pasture, and we get to a clearing that was expressly used to shoot. We get all of our pistols out. He said: Yeah, just stick it in there, rack the slide, aim, and, you know, hit the target. So I fire. And I miss almost everything. And he walks over to me, takes the gun out of my hand, turns it sideways, and says, "Don't hold it like this." I mean, that that was hurtful to me because I was already in a state of anxiety. I was already afraid of what this weapon can do. I was extremely reverent — still extremely reverent about guns. And I felt like he was really just turning the knife on me. You know what? To hell with this. I have to get better at this than anybody else on Earth. I have to. Meraji: Yeah, your words are: You wanted "to become a Jedi Master with a gun." Young: Damn right, man. Yoda was going to be — me and him were gonna be on Dagobah and we were going to get after it. I only met him because I needed to go through the concealed carry class to further my education to be a responsible gun owner to be licensed in the state of Oklahoma to carry a firearm. And he was the instructor at this course and gun range that I had chosen to participate in. How good he was with a firearm, how much he knew about firearms, lead me to believe that he could help me. And he said, "So, when you want to start?" And that was the kindest anybody had ever treated me as far as getting to know firearms and guns. Shereen, I'm a black man. And that carries lots of connotations and I don't get to — let me put it another way. I am a black man who walked into the studio with a Lincoln High Jesus Shuttlesworth jersey on, jumper jeans and Air Force 270s. I wear dreads. I have a beard. I do not get to say how people immediately receive me, but how people immediately receive me is like, they might — downstairs at the front desk where, "Yo messenger, go around to the dock," or a gangbanger. You know, I'm the author. I'm the guy coming in to be interviewed. I'm not the guy picking up a package. I'm the guy going after a Ph.D. I'm the guy who wrote the book. I'm the guy who's not been to prison. I'm the guy who doesn't have any misdemeanors, felonies on his record. I'm the Eagle Scout. I have to say all these things to put people at ease. A gun ain't going to help that! So I put it down. You know, it's locked up, but I have guns because I'm a black man and they were taken away from me. And that is — that is a history and a right that I don't get to forget. I don't get to act like that's not a big deal. But I also don't have to feed into the argument that I've got to carry a gun everywhere I go to be safe. Janaya Williams and Natalie Friedman Winston produced and edited this interview for broadcast. Patrick Jarenwattananon adapted it for the Web.